Swift Glass supplies the most popular types of gauge (gage) glass from top manufacturers that serve pharmaceutical, laboratory, industrial and electronics industries. Duran® tubular gauge glass is ideal for use in applications such as restaurant equipment, boilers, tanks and flowmeters for oil, water and gas. Pyrex® Cylinders: Engineered to meet exacting specifications, Pyrex® brand 7740 glass cylinders and jars provide good thermal endurance, resistance to thermal shock, excellent mechanical strength and high chemical resistance. Pyrex® Oil Cup Glass: Pyrex® oil cup glass is used as an oil reservoir in lubricating devices. Pyrex® Gauge Glass: These tubular devices indicate the level or amount of liquid in tanks and vessels. Pyrex®High Pressure Gauge Glass: Pyrex® offers heavy wall glasses that meet high pressure code 7740. It is used for services that require higher temperatures and greater pressure than standard gauge glass can withstand. Macbeth Borosilicate Gauge Glass is available in standard, high pressure, and reflex. Macbeth flat gauge glass is widely and commonly used for viewing liquid levels. 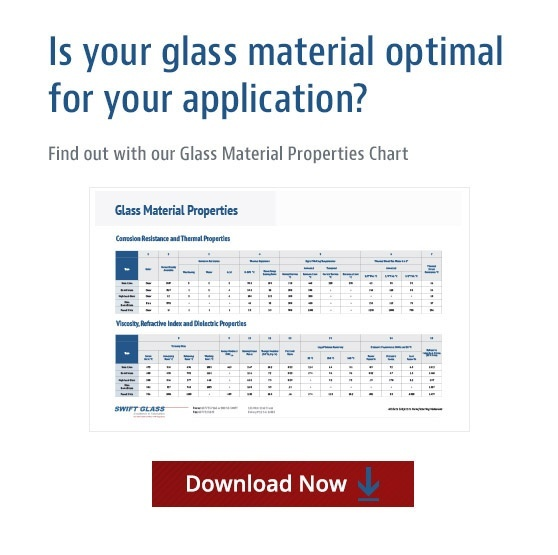 For our complete selection of gauge glass, view the table below. If you have any questions about our materials, please don’t hesitate to contact us. This tubular glass is used in low pressure applications, low pressure boilers, restaurant equipment, closed tanks. Pyrex® and Duran® offer heavy wall glasses that meet high pressure code 7740. It is used for services that require higher temperatures and greater pressure than standard gage glass can withstand. This borosilicate tubular gage glass is designed with a red line between two white lines. The color contrast makes it easier to read the liquid level. Heavy Wall gage glass is commonly used in liquid level gage and sight flow indicator applications that exceed the temperature and pressure of high pressure tubular gage glass. Designed with a redline between two whites lines for easier reading, Heavy Wall Gage Glass is commonly used in liquid level gage and sight flow indicator applications that exceed the temperature and pressure of high pressure tubular gage glass. Designed to use in armored-type liquid level gages, Type-A Plain Gage Glass provides a high-strength tempered borosilicate glass with a high degree of visibility. Type A Plain Gage Glass is designed for moderate-pressure steam boilers and for liquid level indicators. Designed to use in armored-type liquid level gages, Type-A High Pressure Gage Glass provides a high-strength tempered borosilicate glass with a high degree of visibility. Type A High Pressure Gage Glass will tale non-steam pressure up to 5000 psi. Glass gaskets are designed for a variety of standard purposes. They work well in mild acids, hot water, inert gases, and alkalines. They also can be used in a number of high pressure and high temperature applications such as petro-chemical, refinery and powerplants. A glass cylinder used as an oil reservoir in lubricating devices. Borosilicate Glass for a variety of industrial, scientific and architectural applications. Borosilicate tubing offered as Red Line, Standard, Heavy Wall and High Pressure. Used in applications where measuring of liquid level is needed.